For anyone managing or owning a professional health and wellness facility, scheduling is critical. Staff members are the lifeblood of any successful health and wellness enterprise and it can be difficult to keep track of all of your employees. 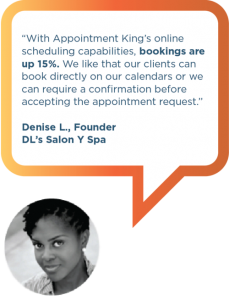 With Appointment King, scheduling your staff members’ appointments is as easy as adding the names; within a few clicks, the schedule is complete. Each employee will only view the appointments that directly pertain to him or her, reducing confusion and streamlining the appointment scheduling process. So for the ultimate in online health and wellness appointment scheduling, choose the advanced design of Appointment King. Save time, save money and provide the best patient care available. Your employees and clients will benefit from the increased stability of a streamlined appointment process. Don’t wait, try Appointment King for health and wellness today!